BANDAR Sri Permaisuri is offering buyers a chance to own a home near the Kuala Lumpur city centre at an affordable price. Located on 216 acres in the south-west of Kuala Lumpur, within 10 minutes from the city centre, the township is fast maturing into an ideal address for many city folks who are looking to stay close to the city and take advantage of its infrastructure facilities. Sharing common boundaries with Cheras, Salak South and Bandar Tun Razak, the township has easy access via the East West Link Highway, Kuala Lumpur-Seremban Highway, North-South Expressway, and Middle Ring Road II. 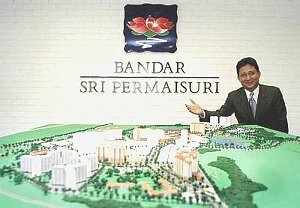 The population of Bandar Sri Permaisuri is expected to increase to 50,000 in the next four years from about 30,000 now. Some 30% of the population are civil servants. Since the project took off in 1995, the developer Dwitasik Sdn Bhd has set out to provide medium-cost housing for city folks, in line with Kuala Lumpur City Hall’s (DBKL) plans to develop the area into a residential and commercial hub for Bandar Tun Razak. Bandar Sri Permaisuri is a privatised joint venture between DBKL and Dwitasik Sdn Bhd. The two turnkey contractors and project managers appointed for the development are PPC Glomac Sdn Bhd and Vistasik Sdn Bhd. The development is divided into 17 parcels comprising 10 residential and seven commercial parcels. Upon completion in 2009, there will be 8,022 residential units and four million sq ft of commercial and retail space. So far, seven residential parcels featuring 6,026 housing units and two parcels of commercial development totalling 380,000 sq ft of commercial space and 82 shop offices have been completed for a gross development value (GDV) of RM750mil. The completed residential precincts are the gated Villa Laman Tasik Townhouses (386 units), Bayu Tasik I Condominiums (690 units), Vista Tasik Condominiums (360 units), Cendana Apartments (770 units), Cemara Apartments (1,140 units), Sri Penara Apartments (2,686 units) and Bayu Tasik II Condominiums (640 units). As for the commercial component, the Bandar Sri Permaisuri shopping village comprising 80 units of three-storey and two five-storey shop offices, worth a GDV of RM73.4mil, have been completed. At present, two blocks of 790 Cengal condominiums and a block of 646 low-cost flats are under construction and scheduled for completion by the end of next year. By then, the township's population would have increased to 40,000 people, thus providing a critical mass for other future commercial developments. In the pipeline are two remaining parcels of 646 condominiums for launch in the third quarter this year. In the commercial precinct, a proposed commercial complex on 12.5 acres has been proposed for launch in the middle of next year. According to Dwitasik executive director Wan Mohamed Yaacob Datuk Wan Salaidin, the company has successfully kept to the construction schedule despite having gone through two economic downturns during the regional financial crisis and the Iraq war. “This can be attributed to the affordability of our properties and the strategic location of the township, being located at the centre of the Multimedia Super Corridor and between Kuala Lumpur and Cyberjaya, Putrajaya and the KL International Airport in Sepang,” he told StarBiz. With price tags from RM120,000 to RM190,000, or about RM160 per sq ft, its range of condominiums and apartments is still considered affordable compared with other neighbourhoods in the area. There are also other higher-end condominiums that have bigger built-up of 1,000 to 2,000 sq ft priced from RM300,000 to RM500,000. The shop houses have price tags from RM180 to RM200 per sq ft. In order to maintain the affordability of the properties in the area, the approval of DBKL has to be sought for the property price before the launch of a project. 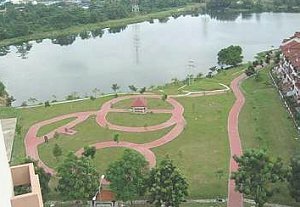 This former tin mine of Yap Ah Loy is preserved to be developed into a recreational lake and parkland for Bandar Sri Permaisuri folks. Mohamed Yaacob said sales revenue had been steady at around RM50mil a year, with full take-up rate within 18 months of a project’s launch. Residents also appreciate the facilities provided that include full clubhouse amenities for all condominium dwellers. “At the prices they pay and facilities they get, the buyers are enjoying five-star facilities at three-star pricing,” he added. On the company’s plans, he said Dwitasik was looking to expand its land bank via joint ventures with landowners in other parts of the Klang Valley and hoped to get another new development going within the next few years. “With the economy growing at between 5% and 6% per annum, the population in the Klang Valley will easily double to four million in the next few years. The need for housing is still quite strong and we see good opportunities ahead,” he added.